Incredibly Soft, Microfiber Sheets. Breathable and Wrinkle Free, 4 Piece Sets. Softer, thicker and more durable than the Egyptian Comfort 1200 sets we also sell, these sheets offer an incredible value for your money. They are made from a super soft and breathable microfiber fabric that allows them to be lightweight and incredibly strong at the same time. This material also ensures ease of maintenance because they will remain wrinkle free after you wash them, and the material will allow you to dry for less time to save on energy costs, and shorten the total time it takes to get them clean. When compared to other microfiber sheet sets, these ones will be thicker, softer and less polyester-ish, so you will never want to take them off your bed. They provide the look and feel of much more expensive sheets, and they come in several elegant colors to match any decor. Available in three different sizes for one low price, and sewn to accommodate thicker mattresses of up to 17" in depth. The king sets will fit regular king size mattresses, or Cal King versions up to 15" deep. Each set of sheets featured here comes complete with four pieces. 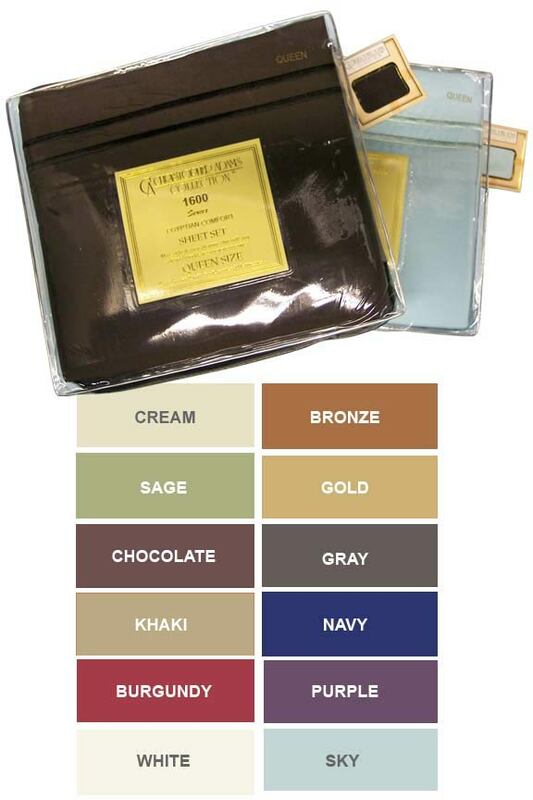 You will get one fitted sheet, one flat sheet, and two pillow cases in your choice of size and color. With this set, the pillow cases feature added embellishment Double parallel lines are embroidered along the edge of each case to improve the look, and add a touch of class. The cases are also deluxe, and feature an additional, inner flap like expensive hotel pillow cases do. The two sheets will not have any added detail, but will be big enough to fit thicker, pillow top mattresses. The fitted sheet is sewn with deeper than normal pockets, so regular height beds are no problem, and they can accommodate ones up to 17" tall. Soft right out of the package, these higher quality microfiber sheets will actually get softer, fluffier, and more comfortable as you wash them. The strong material is durable enough to last through many washings without showing age, and as you use them, the material will become more and more appealing with time. The vibrant colors will also hold strong without fading as these sheets quickly become your new favorite set. When washing one of these sets, you will not have to worry about fading colors, and you will also be able to get them washed and dried in less time than traditional cotton versions. The fabric is naturally wrinkle free, and because it is lightweight, it will wash clean easier, and then dry quicker afterward. This means that you will be sleeping on better smelling sheets that are more hygienic, but it also means that you will save time and money whenever you clean them. Pull them right out of the dryer and make your bed without ever worrying about wrinkles or residual wetness. The microfiber fabric that these sets are made from is lighter and thinner when compared to regular cotton. This does not make the fabric less durable, and despite the thinner sheet, this microfiber material is actually more resilient in most cases. This thin and strong fabric is incredibly soft, and totally breathable, so they will remain cool in the summer, and also provide the perfect amount of warmth and comfort during the colder, winter months. Although these sheets are different from the cotton ones you may be used to, they are still perfect for snuggling , and ideal for any time of year. People of varying preferences and sleep styles choose these sheets based upon comfort alone. Sleep on more comfortable sheets without breaking the bank. These affordable sheet sets will feel great as you lay on top of them, and they will stay that way for many years to come. Get the ultimate in comfort and luxury at a price that everyone can afford. Each set consists of four pieces, and includes the flat sheet, a fitted sheet, and two pillow cases. They also feature extra deep pockets, so they fit perfectly on pretty much every mattresses type. The King size sets will even fit your larger, California King size bed. This makes them perfect for your new pillow top mattress or that waterbed that is impossible to find the right size sheets for. They are offered in a wide array of colors and the three most popular sizes. Anyone is sure to find the perfect fit for every bed in their home. These elegant linens will feel soft and smooth to the touch thanks to a the 1800 thread count microfiber construction, and they actually get softer and silkier with each and every washing. They are comparable to versions sold at local department stores, but at a fraction of the cost. In many cases you will end up paying more than double for a similar set locally. Looking for sets that cost a little bit less? Check out the Egyptian Comfort 1200 Sets. Order Yours Today! Queen Dimensions Flat Sheet: 90" x 102" Fitted Sheet: 60" x 80" Pillow Cases: 20" x 30"
King Dimensions .. Fits Cal King Beds up to 15" high. Color Your Choice (Beige, Bronze, Burgundy, Chocolate, Purple, Gold, Gray, Navy, Rust, Sage, Sky or White) *Please note: All colors may not be available in all sizes. Luxurious feel without the high roller price tag. The strong fabric will remain soft, durable and wrinkle free for years to come. Get the look and softness of Egyptian cotton at an affordable price. Order Yours Today! I love these sheets. Definitely won't be using any other brand than Christopher Adams! can you buy regular size pillow cases seperately? Most orders for sheets will ship the same day they are placed. You will see expedited shipping options and their costs as you proceed through the checkout process, or if you use the calculator in the cart.